Aretha Franklin died at the age of 76. 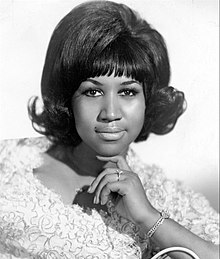 She was know as the "Queen Of Soul" at her home in Detroit, Michigan. She died at 9:50am Thursday morning on 8/16/2018. It was said that she died of advanced pancreatic cancer. Aretha had 88 Billboard chart hits of which 40 them were top hits. For eight years straight she was the best female R&B performer. Aretha had also won 18 Grammy awards in her lifetime. Although she was raised in Detroit, Michigan, she was born in 1942 in Memphis, Tennessee. Her father was a minister and a gospel singer and I guess singing just ran in her blood, because the woman could sing! The video above is by Ioanna17. I like this video because it plays " Aretha Franklin - I say a little prayer" and has lovely pictures of her when she was young. If you want to learn more about her and her career you can click here to go to Wikipedia. Rest In Peace Aretha and thank you for all the great music you have given us. This video is my favorite when she sangs "Think" in The Blue Brothers movie. Below is Aretha's full memorial service by Global News. It is over 10 hours long. Not sure how long this video will be visible to see. In this last video of Aretha she looks so frail. It brings tears to my eyes to see her this way. A merchant's must have tool.